Obsessed with Scrapbooking: Got Kids and Need Inspiration this summer? Got Kids and Need Inspiration this summer? Looking for something fun to do with your kids or grandkids this summer? Look no further because Lain Ehmann has another great online event happening on July 27 called True Scrap Kids! Here are the details of her newest offering, True Scrap Kids! And have the time of your little life! 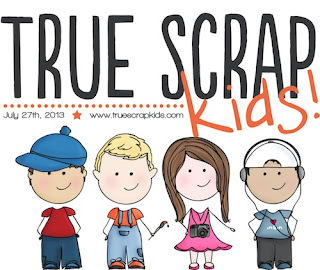 True Scrap Kids is a sister event to the extremely popular True Scrap events, produced by Lain Ehmann. Through True Scrap, Lain has produced five spectacular, ground breaking events and educated thousands of satisfied students. Can't make it that day? No worries, everything is recorded! Click here to view more details about True Scrap Kids! P.S. Sign up now to automatically save $20! 1) Leave a comment below - Do you have kids in your life that craft? I do - my daughter mostly uses Copics and draws Manga style. She is a fabulous artist. 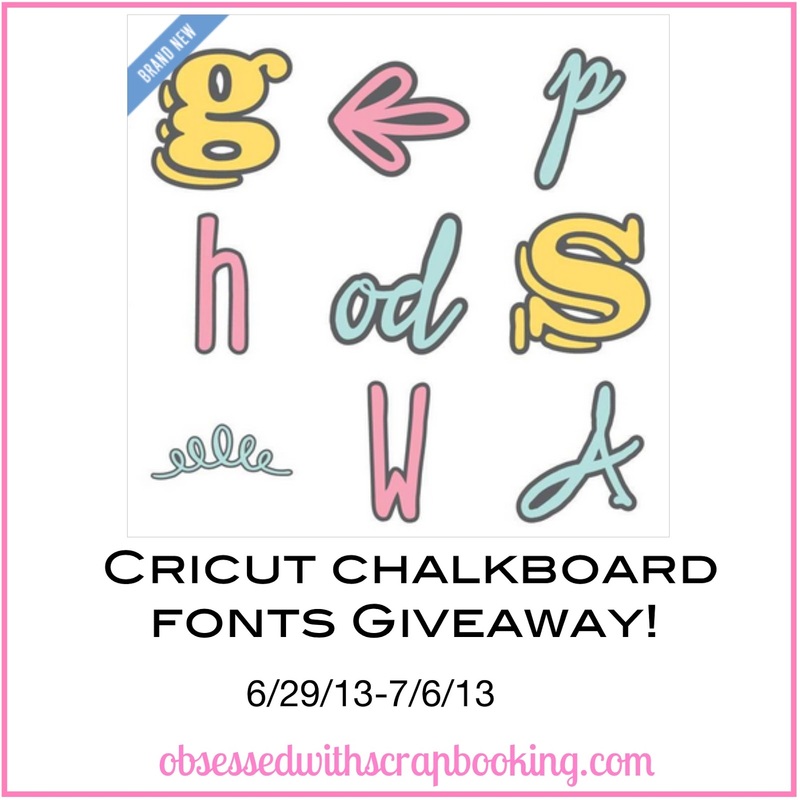 Winner will be announced on Sunday, July 7, 2013 and has two weeks to claim prize. Allow 2-4 weeks to receive. This post may contain affiliate links to fund my diet coke habit, which is necessary in running Obsessed with Scrapbooking. My son loves to doodle...my daughter doesn't draw or craft. My daughter LOVES to do art projects and make crafts. We try to do something crafty everyday. She really likes using my craft scissors and circle punches. Great idea!!! Kids need something to keep them busy!! My two grandkids take after their artistic mother. My grandson is very into origami and my 6 year old granddaughter loves to cut and create. I watch them during the summer and we are always looking for new things to "create". They adore my cricut. Thanks for another chance to win a great product. My grandson loves any crafts but really is into his project life. I have a 7 yo son who will help me cut out a few sport/boy shapes from my Cricut but that's about the extent of his crafting at this time :) Thanks for a chance to win!! I have an almost 6 year old who loves to craft and an almost three year old who wants to do whatever her sister is doing. This summer I'm starting the older one on scrapbooking....we're making a mini album of all her summer adventures! What a great font cartridge! Thank you for a chance to win! Cute cartridge! Looks like lots of fun ahead:-) . My 14 year old will sometimes do projects. Although, now her older sister is expecting twins she wants to make things for the babies. My daughter is grown but she has always done drawings and has done several scrapbooks. I have a friend who needs stuff to do with her kids....I think I will pass this along. Thanks. My stepdaughter loves going through my stuff and making things for her friends. She also loves to take card making classes with me. My daughter likes doing crafts with me. My daughter = not young anymore - she was the one that got me into scrapbooking. Now I scrapbook and make cards. My 17 year old daughter makes her own cards and does a fabulous job. Several years ago I bought her some of her own scrapping supplies but she never really got into scrapping with me. my grandchildren like to hang out in my craft room when they come for a visit. My two granddaughters craft once in a while, but not very often. Thanks for the chance to win! My son loves to make things with paper!! I have to work to keep him from going through all my stuff! My daughter loves to craft and scrapbook. My nieces and nephews love crafts and I enjoy doing it with them. My sons are into origami for crafts. Sometimes, they hang-out with me in my craft room, playing with my punches and stamps. They make cards, too. I have a grown daughter who is as passionate about scrapbooking and cardmaking as I am. We enjoy working together. We would love to have this new cartridge. Thanks for the chance to win. I have been eyeballing this cartridge for a while now so I'd be delighted to win it. What a treat! Thank you for the chance to win! That font looks great!!! chalkboard!! Wow, great to see fun things to do with kids and their moms for the summer! Am enjoying being an empty nester myself! Would love to win thiscart. I have 2 daughters that love to craft and one that does occasionally. Thanks so much! My kids are grown but not I have grandchildren that like to craft. Love the cart, thanks for the chance to win! My daughter (9 years old) is constantly crafting. If she could sit on my shoulder while I craft, I'm sure she would. She is always looking over my shoulder to get ideas and always tweeking my projects. Thank you very much for the chance to win this awesome cartridge. My niece likes to scrapbook. She even got a Cricut Mini for Christmas last year! I have three adult children and two out of the three are creative and enjoy crafting. I was a Preschool teacher for fifteen years and had plenty of supplies in our house. The girls always enjoyed crafting. Great memories! I have a granddaughter that will be three in August. Since about a year ago, she's been obsessed with my scrap room! She loves to play with my Cuttlebug, ribbons and stamps. I always let her since I would love to have a partner in crime in a few years. my 11-year old daughter likes to scrapbook, make cards, make duct tape items and has just learned to crochet. we love going to Michael's together! thanks for the chance to win! No kids at home I'm afraid but man I would love to win chalk board fonts, not available in New Zealand yet and would be great with my daughter getting married in February. I have grandkids who love to craft with me. Thanks for the info on True Scrap Kids! I have grandkids who love to craft with me every weekend they come to visit us at the lake. They just expect some craft projects every time, too. 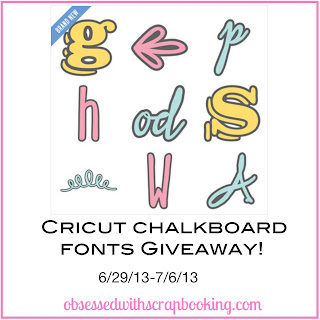 We'd love too win the chalkboard fonts cartridge. Thanks for the chance to win! My daughter is a wonderful artist. She often draws the characters in the books she is writing. Tho she isn't a little one anymore. This cartridge is a the tip top of my crafting wish list!! Fingers, toes and eyes crossed. Great ideas for kids. love the cartridge for the giveaway. No kids home but love the cart and my daughter's gettin married this year... Thanks for the chance to win! My grandaughter is an avid scrapper at age 4 and has her own scrap space!!! Love the cartridge and hoe I win! Oops! I meant hope I win! Love this cartridge! Thank you for the opportunity to win! My grandkids love to do crafts and love the cricut. Wish my granddaughter lived closer...this sounds like fun. The chalk font looks like it would have a lot of uses too! No, both of my 'kids' are actually adults now but my youngest (21) loved to craft with me when she was little! She even had a game that she played - she was Carol Duval and SHE taught ME a craft! Those were the days & I miss them so much. I do have a new Grandson but he's still only 5 months old so it will be awhile but I wouldn't be surprised if he said the word Cricut BEFORE "mommy" or "daddy", LOL! So for now I just teach my craft to adults until my DGS is older! Thanks for the chance to win that great cart! I'd love to play with that!!! BTW, I'm a subscriber & a follower - for a few years! Love your blog and thank you for the coupons each week! My daughter has always enjoyed crafting since she was very young ... she is now 28. But when she has an idea, she comes to me, we figure it out and off she goes. I love seeing her creative side! This is the perfect cartridge for crafting. I do a lot of crafting using alphabet fonts, this one would be perfect. My grandsons love to draw. My granddaughter is just 4, and she loves to play with all my girly crafting stuff. They all love my Cricut. I'm glad they all have some interest in artistic endeavors!That Chalkboard Font would be fun to use! My nieces love to craft when they come over during the summer. They also love to raid all my crafting goodies! My daughter is not a big crafter. Only from time to time does she like to draw or mold clay. I hope when she gets older she will want to make cards with mom. I a 2 1/2 year old who loves to paint. She will spend hours at her easel. I love it because she takes after me. of course she has to paint outside because the paint gets every where, including herself. It usually results in bath time after! I only have nieces and nephews and while they love to craft, we never do it together. They're more into beads than papercrafting. My great niece is the only kid in my life right now that does any crafting, but I want to get my grandson involved, maybe something macho (like scrapbooking). My grandson already loves to paint and draw, so I have great hopes for his crafting ability! I have a 28 yr.old daughter that has a brain injury. It seems that the injury she suffered 11 years ago did not affect her artistic ability. Nicole scrapbooks and makes cards. She has use of only her left hand, thank god she is left handed! I have 10 grandchildren (we have 14,mostly adopted,children) who knows how many grandchildren we will have someday :) Some of them love to come to Grandmas house and make stuff on the Cricut for school projects and cards for all occasions. My oldest daughter loves to scrapbook. My middle daughter likes to do latchhook and plastic canvas. My youngest daughter hasn't shown much interest in crafting yet. Although my kids are pretty crafty, it was mostly school project related and they always loved to get into "moms stuff" to get creative with! My DD loves to paint and draw. She's been doing it since she first drew on our wall with her crayons. lol. I love your cards and and the ideas on how to use the Cricut Cartridges. I love Cricut Craft Room. Thank you so much for posting these videos to help with CCR! I love the chalkboard look. It is so fun! Thanks for all the great tips and ideas. I really love love love this cartridge. Thanks for the chance to win! I would love to win this to use in my classroom! My summer ends on August 6 when we go back to school, but I still have TWO trips to look forward to: NYC and Las Vegas!!! Planning to work on heritage album after finding old family pictures in a box. Excited to get started. I would love this cartridge...great way to get my scrapbook projects caught up over the summer. thanks for sharing all your ideas!! The colors on your card work so well together. I really like the small amount of bling you used too. Thanks for a chance to win. My plans for the rest of the summer are to enjoy family friends coming up for a visit to our new home we just moved into (Murrayville GA). We moved from florida because love the mountians!! I love this Chalkboard font, would love to have it!! Thank you! My niece does scrapbooking (she's in high school) - we sometimes shop for craft items together, along with her mom (my sis) who also crafts. I am going to spend the rest of the summer completing last year's scrapbook. I'm half finished and it's weighing on my conscience! This cartridge would really help!!!! Love this cartridge, I could really use it to complete some projects that I have started. My daughter is 21 and scrapbooks with me when she has the time. My daughter just finished her summer internship. I plan on having her help me organize pictures. She's going to love me! My granddaughter likes to craft - I just wish I got to see her more often! My oldest likes to craft. My daughters are wonderful artists - 8 and 5 and 9 months. They love to craft with me - we have started scrapbooks, we make cards for most family events, we have art journals, and my oldest daughter is a featured artist for her elementary school - her art will be part of the permanent collection at her school until 2018 and it will be on display at our local library! We are artsy! Thanks for the chance! Can't wait! The WHOLE family, children & grandchildren, will be cruising together to celebrate my big birthday!